A resource account is also known as a disabled user object in Azure Active Directory, and can be used to represent resources in general. In Exchange it might be used to represent conference rooms, for example, and allow them to have a phone number. A resource account can be homed in Microsoft 365 or on premises using Skype for Business server, and these accounts are created using Powershell commands. 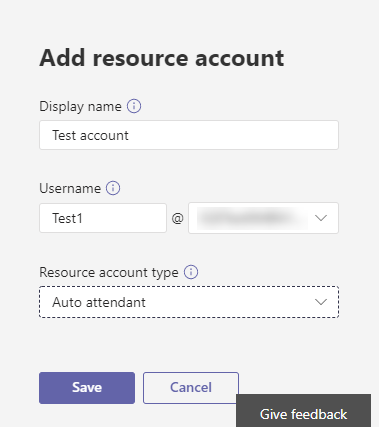 In Microsoft Teams or Skype for Business Online, each call queue or auto attendant is required to have an associated resource account. Whether a resource account needs an assigned phone number will depend on the intended use of the associated call queue or auto attendant. Refer to the articles on call queues and auto attendants linked at the bottom of this article before assigning a phone number to a resource account. An auto attendant or call queue is required to have an associated resource account. See Manage resource accounts in Teams for details on resource accounts. Direct Routing service numbers for auto attendant and call queues is supported for Microsoft Teams users and agents only at the moment. You can assign a Direct Routing Hybrid number to your resource account. See Plan Direct Routing for details. For Microsoft calling plans, you can only assign toll and toll-free service phone numbers that you got in the Microsoft Teams admin center or ported from another service provider to a resource account. To get and use toll-free service numbers, you need to set up Communications Credits. User (subscriber) phone numbers can't be assigned to a resource account. Only service toll or toll-free phone numbers can be used. To assign a phone number to a resource account, you will need to get or port your existing toll or toll-free service numbers. 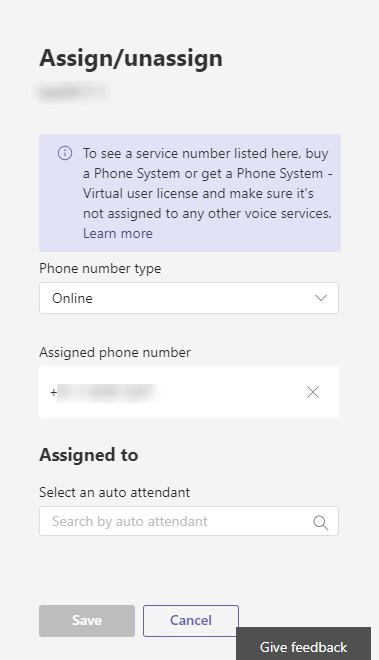 After you get the toll or toll-free service phone numbers, they will show up in Microsoft Teams admin center > Voice > Phone numbers, and the Number type listed will be listed as Service - Toll-Free. To get your service numbers, see Getting service phone numbers or if you want to transfer an existing service number, see Transfer phone numbers to Office 365. If you are outside the United States, you can't use the Microsoft Teams admin center to get service numbers. Go to Manage phone numbers for your organization instead to see how to do it from the outside of the United States. 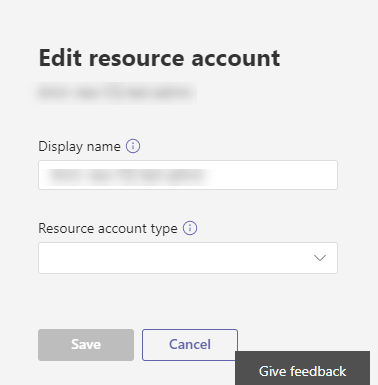 In Microsoft Teams admin center, navigate to Org-wide settings > Resource accounts. To create a new resource account click + New account. In the pop-up, fill out the display name and user name for the resource account (the domain name should populate automatically) then click Save. Once you've created the resource account and assigned the license, you can click on Assign/Unassign to assign a phone number to the resource account, or assign the resource account to an auto attendant or call queue that already exists. If your call queue or auto attendant still needs to be created, you can link the resource account while you create it. Click Save when you are done. You can edit the resource account display name using the Edit option. Click Save when you are done. Depending on whether your resource account is located online or on premises, you would need to connect to the appropriate Powershell prompt with Admin privileges. The following Powershell cmdlet examples presume the resource account is homed online using New-CsOnlineApplicationInstance to create a resource account that is homed online. For resource accounts homed on-premises in Skype For Business Server 2019 that can be used with Cloud Call Queues and Cloud Auto Attendants, see Configure Cloud Call Queues or Configure Cloud Auto Attendants. Hybrid implementations (numbers homed on Direct Routing) will use New-CsHybridApplicationEndpoint. If you want the call queue or auto attendant to be searchable by on-premise users, you should create your resource accounts on-premise, since online resource accounts are not synced down to Active Directory. To create a resource account online for use with an auto attendant, use the following command. New-CsOnlineApplicationInstance -UserPrincipalName testra1@contoso.com -ApplicationId “ce933385-9390-45d1-9512-c8d228074e07” -DisplayName "Resource account 1"
You will not be able to use the resource account until you apply a license to it. For how to apply a license to an account in the O365 admin center, see [Assign licenses to users in Office 365 for business](https://docs.microsoft.com/office365/admin/subscriptions-and-billing/assign-licenses-to-users?view=o365-worldwide#assign-licenses-to-one-user as well as Assign Skype for Business licenses . (Optional) Once the correct license is applied to the resource account you can set a phone number to the resource account as shown below. Not all resource accounts will require a phone number. If you did not apply a license to the resource account, the phone number assignment will fail. See Set-CsOnlineVoiceApplicationInstance for more details on this command. It's easiest to set the online phone number using the Microsoft Teams admin center, as described previously. When finished, click on Save.